Abstract: The speed and bandwidth of modern USB drives caught the attention of Microsoft, and it long ago integrated a tool called ReadyBoost into its Windows Vista operating system. Nothing beats the ease of using a USB flash drive to move data around. Stick it into the USB slot and use it like a hard drive, what could be simpler? Of course it helps that the little devices have exploded in terms of storage capacity and access speed, all this while becoming physically smaller. The speed and bandwidth of modern USB drives caught the attention of Microsoft, and it long ago integrated a tool called ReadyBoost into its Windows Vista operating system. This is a feature for those of you with older computers, intended to allow Windows Vista to run smoother. Of course, if you don't want to dedicate your USB drive to be a system cache, you can still use it like a regular USB drive and store whatever you want on the little unit. 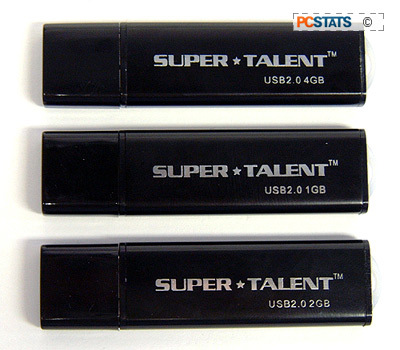 In the last couple of years Super Talent has made quite a splash in the enthusiast computer memory market however it also has a huge USB flash drive business. Many of its USB flash drives are made for other companies, so perhaps you've already used a MA Labs Super Talent USB drive without knowing it. ;-) Now Super Talent is getting into the retail side of things, and while its USB flash drives are not as fancy, it delivers in raw performance and capacity. How does a USB drive with 200x transfer speeds (or 30MB/s) sound to you? Of course that's the top read speed but that's definitely very impressive and much better than earlier generations of USB drives. Super Talent's DH series of USB drives come in capacity sizes ranging from 512MB-8GB and we were lucky enough to snag three models, the 1GB, 2GB and 4GB versions. The best part though is that these drives are a real bargain! The 1GB Super Talent drive goes for $10US, the 2GB $17US and the 4GB $32US! 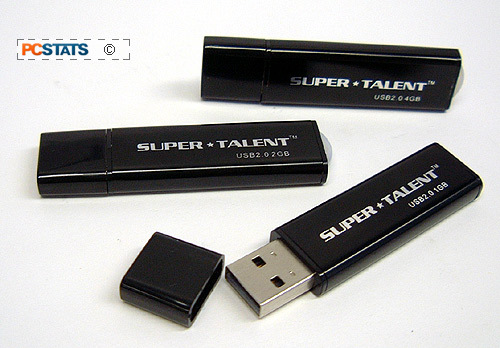 The Super Talent DH Series USB drives are plain looking, but heck they're USB drives right? The body of the USB drive is aluminum while the black cap is made from plastic. On the side of the drive are simple markings, the Super Talent name, the fact that the drive is USB 2.0 compatible and the capacity. The Super Talent DH USB drives are 64.5 x 16.8 x 7.1mm in size, not the smallest USB drives on the market but small enough to put in your pocket easily. The drives are compatible with both the USB 1.1 and 2.0 standards and support Hot Plug. According to Super Talent its DH USB drives have more than 10 years data retention and the drives come with a limited lifetime warranty. There's a red LED usage indicator on the bottom of the USB drive which flashes when the device is in use. Straight out of the packaging, the 1GB, 2GB and 4GB Super Talent DH USB drives are compatible with Microsoft Windows ME/2000/XP/Vista operating systems, as well as Linux and Macs. Each of these Super Talent USB drives have a 200x or 30MB/s read rating and write speed of 180x or 27MB/s. All are Windows Vista ReadyBoost compatible. The Super Talent DH series USB drives are equipped with Samsung K9K8G08U0A-PCB0 NAND flash memory which has an endurance rating of 100k program/erase cycles.